Posted July 22, 2011 by William Martin & filed under Galleries. A group photo of all the dwarves from Peter Jackson’s upcoming The Hobbit movies has been released, featuring Aidan Turner (Being Human) and Richard Armitage (Spooks) in costume. The Hobbit: An Unexpected Journey, set to arrive in cinemas on 14th December 2012, and The Hobbit: There And Back Again, due for release on 13th December 2013, are currently being filmed back-to-back in New Zealand. Aidan Turner left the cast of Being Human earlier this year in the final episode of Series 3, while Richard Armitage departed Spooks at the end of last year’s Series 9. Based on J. R. R. Tolkien’s 1937 novel, the prequels to The Lord Of The Rings film trilogy will also star former Doctor Who actor Sylvester McCoy as Radagast the Brown and Martin Freeman as Bilbo Baggins. Freeman’s Sherlock co-star Benedict Cumberbatch will provide the voice of Smaug. 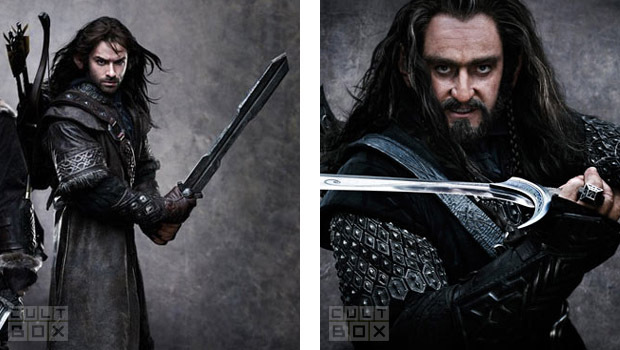 The new cast image shows Richard Armitage (centre) as Thorin Oakenshield and Aidan Turner (far right) as Kíli, one of Thorin’s nephews.